Bessie Bump and Friends is a unique collection of 4 stories that allow children to enter the world of challenging emotions through the eyes of the colourful characters of Bessie Bump, Sheridan the Shark, and Tatyana the Piranha. A vital part of all children’s education and development is to learn how to understand their own emotions and those of others, even when guised in behaviour or physical signs. Such understanding leads to healthier choices in life as adults and more happy and harmonious relationships. 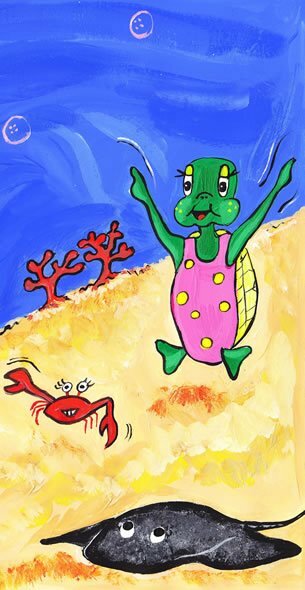 The stories tackle the difficult subjects of parental separation, blended families, bullying and loneliness through the eyes of Bessie Bump our bright turtle, Sheridan the loveable shark and Tatyana the loyal piranha. At the end of each story there are a series of questions that can be used to help create conversations around the issues and emotions raised in the story. In this way adults can help children learn more about emotions and good ways in which to cope with them and handle the more challenging ones. Amberley Meredith M.Sc. has been practising in the field of psychology and well being for 20 years, working across continents with both adults and children from a variety of cultures. A resounding theme running across all these years has been that when a person is surrounded in a place of love and understanding then they can flourish and grow to be their at their best and their happiest in all ways.